Written March ’06  quite long, and there’s a fair bit of crapping on in the middle about a track day, the start and finish of which are noted in bold type. A project I’ve been trying to get sorted for some time, we now have a header set available to replace the cat on the S2R 800 and S4R Monsters. It’s been developed to fit both std mufflers and the DP muffler kits, so should avoid the hassles some other header sets apparently have when DP kits are fitted. The first two photos below show the header fitted with Staintune mufflers and polished original header stubs and S pipes - it fits well with them also. And yes, there should be a S2R 1000 header available very soon. As we have a S2R 800 demo I took the chance to fit a development header set and do some tuning, including a day running around Phillip Island with the data logger fitted developing a map for the Ultimap U59 ECU. I’ve also run the bike with both std and DP kit ECU, using the Staintune Fuel Injection unit (SFI) to add fuel as required. See the report “Staintune Fuel Injection/Dobeck Performance/Techlusion Unit” for some more info specific to it. The bike itself is a demo S2R in the rather cool Tangerine with black stripe colour scheme. It doesn’t hit very cool status due to the tangerine being far more red than I first anticipated  I love a good strong orange myself. 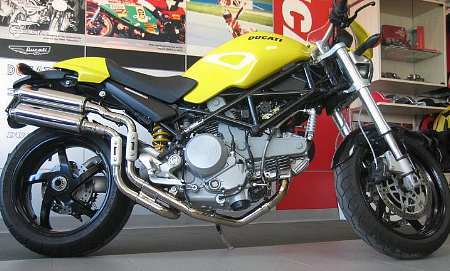 But it’s the pick of the range for me given the slight lack of zing the acid yellow has compared to the trad Ducati yellow (although I had the Staintune equipped acid yellow bike in for this job since I wrote that line and I must say I’m turning that way). First up the bike was dynod all std (as demo bikes usually need to be), then dynod again with the header set fitted, still with std mufflers. This gave a very similar result to the graph shown in the first S2R report  a dip from 4,500 to 5,500 and more above 5,500. This second design made more above 5,500 than the previous design did, which was good as all std this bike had been a little lacking compared to the first one. The first graph shows the result  all std in green, cat replacement header fitted in red. I‘ve been told by someone overseas that this dip was somewhat common with cat replacement headers, but this is the only one I’ve dynod before/after with std mufflers. 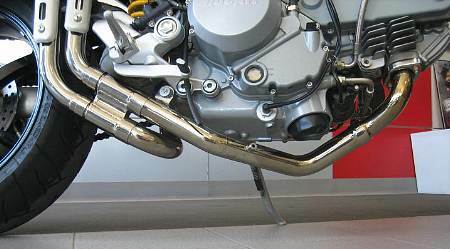 The bike with the Arrow full system fitted also had a dip 500 RPM higher in the range, but the open mufflers helped disguise this when compared to the std muffler with cat setup. So I was keen to find out how our header set would go with open mufflers, etc. As part of the usual tuning preparation the cam timing was checked and reset. I was somewhat dismayed when I checked the vertical cylinder and found it only 3 degrees retarded. The horizontal restored my faith, however, being 7 degrees off the mark. The previous bike I reset the cam timing on (the Arrow full system bike from the previous report) was reset to the std spec of 110 degree inlet centreline. On that occasion I was worried I’d lose some top end by advancing the cams any further, especially given my experience with the 1000. But the before/after dyno charts had showed no top end issue, so this time I thought I’d go a little further. Not far really  we went to 107 degrees, but I don’t think I’d go any further as the over 8,000 RPM range does suffer a little, maybe more in feel than actual power output. Once the cam timing was done we fitted the mufflers and air filter kit from a DP ‘two mufflers on the right’ kit and the U59 ECU, running the map I had developed for the Arrows equipped bike. I wasn’t sure how well this map would work, but it was a good starting point for the data logging and remapping work I was intending to do. With all that done I headed off to Phillip Island for a track day. Of course, it’s never that simple. I’d just bought a new (second hand) laptop so it was off at Duane’s being set up as a dual boot so I could run Windows 98SE as well as the XP it came with. Why you ask? Well, some of the software I have to run on it  mainly Duane’s older eprom stuff  is DOS based, and XP doesn’t support things like this too well. Plus I have to buy s/h laptops as I need parallel ports for said software, whereas pretty much everything new these days has USB only. The track day was on Monday. My reconfigured and loaded with new software laptop and Duane’s twin lambda sensor controller box and probes (expedites the main map/offset map process compared to my single sensor Motec lambda controller) arrived at work on the Friday before - a week where I was working short hours due to Finn having his first week at child care. So I didn’t get to try anything out before I had to leave work on Friday to pick up the little man. And come 3am Sunday morning I was woken by the internal turmoil of gastro, leading to me damaging the Doutlon with both ends for much of the day. About 8pm I finally got ready, drove to work to load more software onto the laptop, organised all the stuff I needed and loaded said stuff and the bike into the shop ute and then headed off to my parent’s place  about half way between home and Phillip Island  to save me an hour or so come Monday morning. I arrived there after 11pm, so was behind the 8 ball from the get go. As expected, I attended the riders briefing in shorts and tee shirt to hear them finish with “White group, you’re out in 3 minutes”. White group being the slow group, the only group left when I booked and frankly the right place for me. It’s been nearly six years since I was on a track, the last being a work run day at Sandown on the Queen’s Birthday long weekend in June ’00  which was a day of a few lasts for me. The last time I was on a track, the last time I rode the mighty KR1S, the (first and) last time I crashed the mighty KR1S and the last time the mighty KR1S blew up with me on board. Followed many months later (after the big crash) by the last time I rebuilt the mighty KR1S and the last time I owned it. And hopefully the last two stroke I own, if I can muster any sense and listen to my own advice occasionally. I have been around Phillip Island before though  on my Guzzi Sport 1100i, a shop demo 996 and the KR1S  back in the days when I was riding fairly well. I did levels 1, 2 and 3 of the Australian (Californian) Superbike School at various tracks on various bikes in the late ‘90s and was spending nearly every Sunday up in the hills full of confidence and riding as fast as I could. The first time I went to Phillip Island was on my Sport 1100i. Compared to Sandown and Broadford it’s a totally different track  big and wide and very fast, in the sense that if you’re not going fast it’s plainly obvious to you just how slow you’re going. Scared the hell out of me. I remember going through GIO  the LH kink after Southern Loop leading into Honda  as fast as I was going down the front straight, with the speedo showing 210km/h from memory. It did occur to me at the time that this was maybe not that sane, but it felt pretty good all the same. The next time was on a demo 996 at a NFI run day. I remember coming out of Siberia (where I had low sided the Sport 1100i) with the 996 pinned in second and grabbing third just before the limiter thinking “man this thing is slow” as I headed up to The Hayshed. And going into turn 12 with 170 on the speedo scared stupid only to realise by the time I’d hit the apex I could have been going much faster and it was too late now. So I’d nail it and play the thinking music in my head until I was on the straight (yes, the corners are that big there). Although all this was put into perspective when I followed Steve Martin around to get an idea of the lines he would use. I remember him disappearing over Lukey (on a 748) as I was coming out of Siberia, sitting up and looking back to see where the hell I was. So I wasn’t really that fast, but I was very confident in how I was doing it. These days I have to consciously think “look where you’re going, not down at the road” nearly every corner I come to. So the slow group was where my arse belonged. The first time I arrived at Honda I looked across the corner only to realise I was looking too far ahead and had to look back again. By the end of the day I was down to only 50 or so km/h slower through the fast corners and regularly laughing at how slow I was going in general, even though I wasn’t game to go any faster. But I had some fun, managed to consistently pass at least 3 others (so I wasn’t the slowest out there) and got some remapping done. Which was the reason I was there anyway  allegedly working. I had one unexpected problem with the mapping too  the bike was running too cold. I had to run the bike for at least 10 minutes before the start of my session to get it up to temp so it was off the warm up trims. In this regard the consistency of water cooled bikes is much easier to deal with. Most of the remapping done at the track was higher RPM stuff  which is quite difficult to do on the road due to speed limits, etc. Of particular importance here is the transition from closed throttle as you open the throttle in the middle of a corner. It’s something you just can’t mimic on the road, no matter how hard you try, but it’s very easy on the track due to the controlled environment and lots of corners. The lower RPM stuff is much easier on the road, and virtually impossible to do on the track without getting yourself dragged off for being a slow moving hazard. So over the next few days at work I did a fair bit of road riding tooling around and lots of roll ons  to fill in the bottom area of the map. All in all it’s not that different to the Arrows map, but different enough to make the exercise worthwhile. Plus I learned some more about tuning which is always useful. Once I had my map done (well, mostly done, I can’t help myself) I headed to the dyno to see how it compared. I was somewhat dreading this dyno run, as the bike had felt a bit flat at the top end on the track. But what it is is what it is, so off I went. Turned out to be pretty good. I realised later the flatness was over 170 odd km/h and 8,000 RPM, which in hindsight is not that bad for a 2V 800cc engine making 78 or so hp in a naked bike with a tubbed up Brad on board. This run shows the bike all std in green, std with cat replacement header set in red and as remapped  cam timing at 107 inlet centreline, DP muffler set, DP air filter kit and U59 ECU - in blue. As you can see, the dip at low RPM is no longer. Power first, then torque and air/fuel. The torque curve is 15 to 20% better at lower RPM, so I’m more than happy with the result. The WOT mapping was changed a little after this to richen the top end a little, but only a few %. It feels particularly strong from 5,500 to 8,000 on the road. Compared to the Arrows equipped bike it does pretty well. It loses a little over 8,000 RPM in comparison, but is stronger under that. Given there is a 3 degree variation in cam timing between them I’d call it pretty much even. Although on the road, Rob’s Arrow equipped bike certainly feels better due to the 14 tooth front sprocket and lightened flywheel. It was only after quite a few laps at Phillip Island that I realised I had another gear to go on the front straight. It was approaching the rev limiter in fifth showing 210km/h, so dropping a tooth at the front is something I’d certainly recommend. Helps with the wheelies too. Moto one bike is green, Arrow equipped bike is red. Once I’d finished the remapping process, which can be something of an ordeal when you don’t have the original base map to start with, (and you’re changing around 400 map points over two fuel maps, not to mention a spark map as well) I tried the bike with the std and DP kit ECU. Just to see what would be needed tuning wise. I figured from the previous runs I’d done on the various S2R I’ve dynod that they would be lean at WOT so I fitted the SFI (Staintune Fuel Injection) unit I have kicking around and went to the dyno. The first results are with the std ECU fitted. I checked the parts list and the Euro spec ECU (we get Euro models) is the same as that fitted to the USA spec models. The SFI is a bit like the old FIM hand held terminal in the regard that you can do a run, change the fuel setting and do another. It’s by far the most efficient method of tuning time wise, as I only need info, not the overall best result and it’s much easier to do the analysis later. I did a base run with the yellow and red pots on 1 (zero added fuel), then jumped up to positions 7, 9 and 11 based on what the air/fuel display was telling me. The next two graphs show the result  power first, then torque and air/fuel. Position 1 is green, 7 is red, 9 is blue, and 11 is pink. As you can see it really falls into a hole when the air/fuel goes over 14 or down to 12 or less. The best power and torque generally come from an air/fuel of 13 to 13.2 or so, but from experience I run them closer to 12.7 for the best on road performance. The problem is to try to get near those figures across the whole RPM range using the two adjustment zones the SFI has at WOT. The next graph shows the air/fuel traces only with two solid black lines across the graph  one at 13.4, the other at 12. Ignore the vertical red and blue lines for now. Realistically, these two black lines represent the range of air/fuel we’ll have to be happy with using this ECU in conjunction with the SFI. So we’d be running a combination of settings between pot positions 7 and 9. Now remember that at any RPM over the RPM switch setting the SFI (Techlusion) adds fuel at all throttle openings, so you need the switch setting above your normal cruise RPM otherwise you’ll end up (in this case in particular) running with a lot of enrichment on cruise. So we really want the switch RPM above 5,000 at least. This brings us to the red and blue vertical lines. To stay between the two horizontal black lines we need to switch from the SFI yellow pot (set to 7) to the red pot (set to 9) between 5,700 and 6,300 RPM. Given the numbers I’d pick 6,000 RPM. I didn’t do any tuning of the green pot (cruise) simply because I didn’t really have the time to ride the bike around lots and play. I’d expect it to need a little more fuel there to be really nice, but it’s the sort of thing I’d tell an owner to play with over time. That’s the only way to do it well when you’re dealing with a compromise like this  try one setting, ride it for a while, try another setting. You’d need to adjust the yellow pot if you were adjusting the green pot  every increment you increase the green by you need to decrease the yellow equally to keep the yellow setting the same. Next up I tried the DP kit ECU. This ECU is a bit richer I know from previous dyno runs, but I’ll compare them in the next graph just to show how much richer. Green is std ECU, red is DP ECU. Both ECU have the idle trimmer set to zero, which gave an idle CO of around 4% on this bike, and the SFI is set to 1 (no added fuel). Next the range of SFI settings. I didn’t bother trying position 11, as I could see there was no point. I’m not sure why the position 3 and 5 curves are so close together, but that’s how it came out. You can see the rich dip at 5  6,000 RPM and that it made the most power with no extra fuel there, but overall the variation between leanest and richest for any two curves is not too bad. Green is SFI position 1, red is 3, blue is 5, pink is 7 and yellow is 9. If we plot another graph like the one above with only the air/fuel traces and the two black lines across it, again at 12:1 and 13.4:1, you can see the reduced variation better. So, with the DP ECU, we’d run position 4 on the yellow and 5 on the red and again switch the RPM around 6,000 RPM. Again I didn’t really do any playing with the green pot, but it did appear to be happier at part throttle with the DP ECU as compared to the std ECU. Finally I refitted the std mufflers, mainly to see what happened to that midrange dip, but also because I’ve had enquiries about running them this way and was curious. Same procedure  run on dyno using the SFI to see what it wanted/needed. First up is power only, as otherwise it gets a bit cluttered. Green is SFI position 1, red is 3, blue is 5, pink is 7, yellow is 9 and purple is 11. Taking position 7 as the best overall run and comparing it to the all std bike and all std with the cat replacement pipe fitted (the very first graph) you can see that damned dip is still there, although in this graph it’s exaggerated by the richness in that particular RPM range  with the right mixture the blue line will be the same as the green line. So the cause of it must be the interaction between the mufflers and the tube style header pipe, which sounds odd, but is the way it is. You can also see the nice improvement through the rest of the RPM range due to the reset cam timing, DP air filter kit and extra fuel via the SFI. All std is green, std with cat replacement pipe is red and cat replacement pipe, reset cam timing, DP air filter kit and SFI @ position 7 is blue. I would have thought (was hoping) the open air filter kit would have leaned the midrange rich spot out a bit, but really the whole curve has been moved upwards (leaner) with the cam timing and air filter mods so comparatively it’s still the same shape with the same overall variation. The next graph shows the air/fuel traces for all std in green, std with cat replacement pipe in red and cat replacement pipe, reset cam timing and DP air filter kit in blue. You can see the blue line is pretty much the same as the red line, just leaner all over. Back to sorting the fuelling using the SFI. The air/fuel only graph shows the big variations you get with this combination  std mufflers, cat replacement pipe, reset cam timing and DP air filter kit. Green is SFI position 1, red is 3, blue is 5, pink is 7, yellow is 9 and purple is 11. Using the two black lines across the graph method as above doesn’t really help much either, but I’ll show it next anyway. Running the yellow pot on 8 and the red on 3 with the switch at 4,700 RPM would keep us between mostly between the two lines, with a richer dip around 5,300 RPM. The low switch RPM may lead to the red pot circuit being activated while cruising, depending on your cruising RPM and gearing. Which in turn may lead to a drop in fuel economy, although in this case the red setting is only 3 (still over 10% at this throttle opening), and you might find the green pot also needs a setting somewhat like this for normal cruise anyway. I don’t know, again I didn’t play with the green pot. One problem that running a large yellow setting brings is a stumble as you take off, just a split second after you let the clutch all the way out. Probably compounded by the fact the clutch lever adjustment, as delivered, has the take up point right out near the rest position, meaning you’ve lost much of your feel by the time you’ve reached that point anyway. The S2R is very susceptible to richness in the area of the map used when you take off from a standing start I’ve found. Took me a little while to work it out when I was tuning with the U59, and I’m sure I’ve had it with the old 800M model too, now that I think of it. It showed up clearly when running the std mufflers and std ECU, as this was the last combo I dynod and I knew both cause and effect by then. It was great on the way to the dyno without any added fuel, but on the way back, with the yellow pot turned up, the stumble was there. Compounding this is the fact the SFI works in pulse width, not %, meaning the effective % increase with a yellow setting of 8 at lower throttle openings is quite large. As the SFI yellow pot circuit comes in at around 20 degree throttle it shows how much you open the throttle getting off the line. At that sort of throttle opening my U59 maps for the S2R are running around 5 or so ms pulse widths, so the yellow pot on 8 is adding 1.1ms, around 20 to 25%. So it’s back to another compromise unfortunately. That or make sure you don’t open the throttle too far under 4,000 RPM. Realistically, some people never do, and others rarely rev them over 5,000. And that’s it for this report. Something I’m sure will please those who’ve made it this far.